Despite its small cast, the Great Lakes Theater Company was able to put on a realistic version of "Les Miserables." 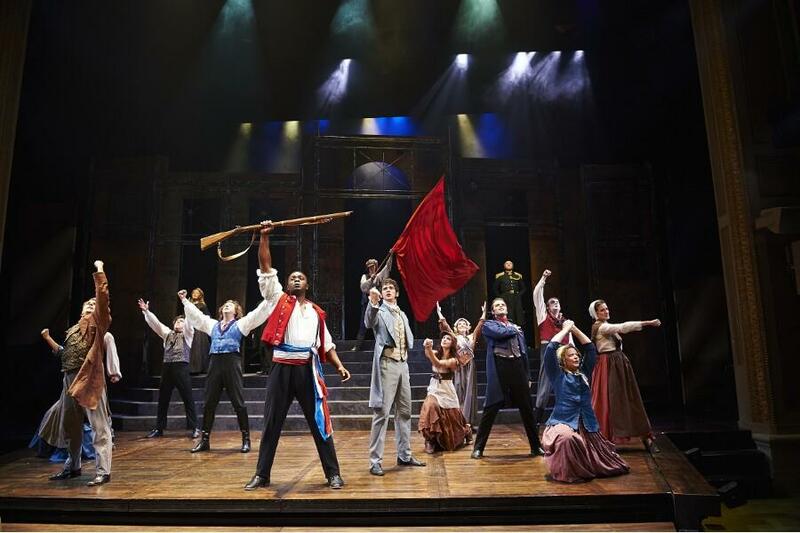 A man embraces religion after years in prison, a young couple falls in love in the midst of violence and revolution simmers just below the surface in “Les Miserables” at Great Lakes Theater. Love triangles and barricades arise on the Hanna Theater stage this fall, and this is a production that Clevelanders won’t want to miss. “Les Miserables” is an ambitious musical for a company of this size. Since there are fewer than 25 actors in the cast, many of them play double roles. Still, they manage—during the large group scenes the Hanna Theater’s stage is filled. The casting and slightly condensed story make this a fast-paced production, and characters sweep on and off the stage as scenes fly by. This streamlines the complicated narrative, but also reduces the time spent on some important scenes. The audience doesn’t get the necessary time to process the misfortunes that befall factory-worker-turned-prostitute Fantine, so although Jodi Dominick portrays her misery well, her struggles don’t hit as hard as they could. This version also leaves out little Eponine, the daughter of a corrupt innkeeper and his wife. Although this choice is practical and will not confuse audience members familiar with the story, it might add another barrier to understanding for the unfamiliar when she enters the story as an adult. Overall, these changes add to the quality of the production. The complex story is carried by a wonderful cast, with Stephan Mitchell Brown acting as a linchpin in his role as Jean Valjean, the reformed convict. Brown brings out both the good and bad within Valjean, and in this production the saintly Valjean is a little more human as a result. Brown also has the strong voice necessary to make his songs not only impressive, but emotionally resonant. The lighting in this production gives the relatively small stage the epic quality it needs for this show. The use of lighting is especially impressive for “Empty Chairs at Empty Tables,” when the dead file onto the backlit stage with hollow eyes and glowing candles. The lighting and scenic designers show their strengths through minimalism as well as on the barricade. As always, it’s great to watch returning actors in these productions. Tom Ford, who plays the innkeeper Thenardier, seems to reference his role last year in “Sweeney Todd” with a flick of his knife and a knowing look at the audience. Almost the entire cast doubles as the cast for “The Merry Wives of Windsor” on alternating weekends, so if you’d like to watch Jean Valjean make popcorn and Cosette hula dance, make sure to pick up tickets for that production as well. Whether you’ve seen the movie adaption or not, know the entire score or can’t tell a Javert from a Gavroche, this production has something for any audience member. In its take on this blockbuster musical, Great Lakes Theater has proven both its daring and its ability.